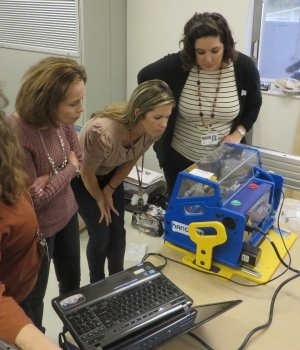 It’s a great idea to take the digital fabrication equipment to the people, rather than the people having to travel to the equipment. 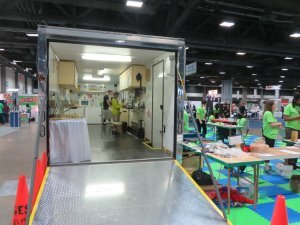 As experience and the type of equipment available have changed, the Mobile Fab Labs themselves have gone through a number of iterations. 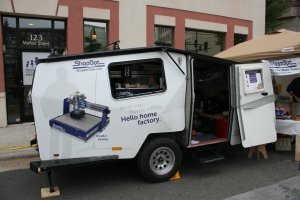 The following is a brief timeline of a few of the mobile units in which ShopBot has been a part. 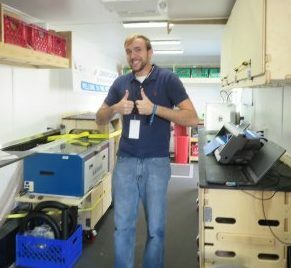 The original Mobile Fab Lab (2007) was designed so that the visitors would come inside to use the smaller digital fabrication equipment. A laser cutter, vinyl cutter, and minimill–as well as an electronics lab–are all accessed through the single side door. 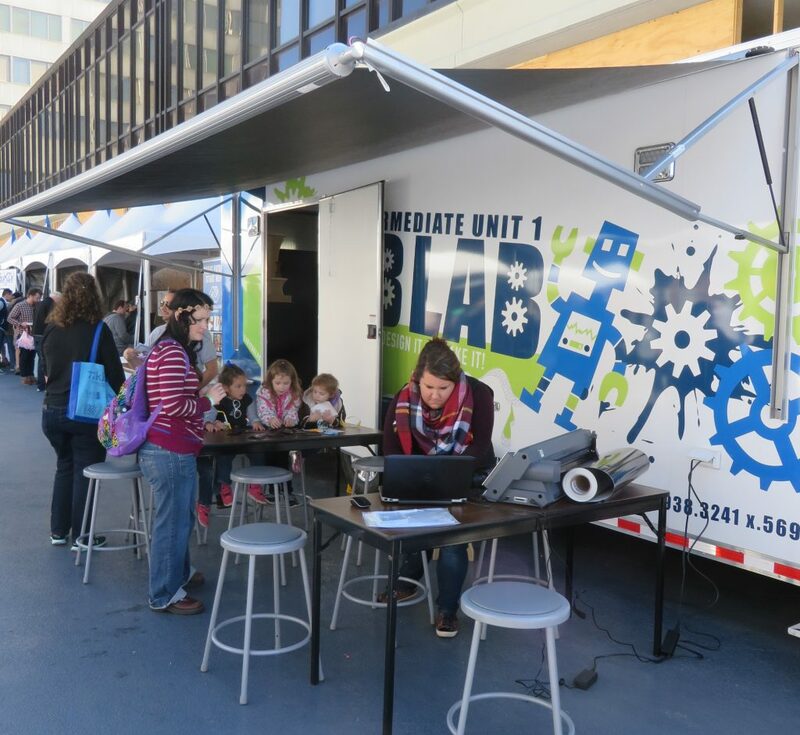 There is a 4′ x 8′ ShopBot with a 4HP spindle fitted in the back of the trailer, with access when the tailgate is open. 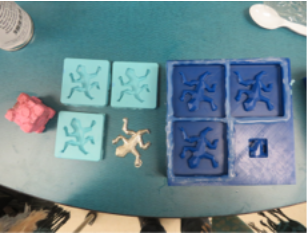 Nadia Peake’s video of the equipment in the original MIT Fab Lab (MFL) can be found here. The Fab Lab trailer is a 2007 Pace American Shadow GT Daytona dual axle (model SCX8528TA3). It is 32′ long, 8′ wide, and 7′ high. The tailgate opens to add a 6′ deck at the back of the trailer. The main entrance is a door on the passenger side towards the front. A 6.5′ tall custom steel box covers most of the tongue. The lab requires a space approximately 60′ long by 16′ wide for operation as a lab. The power requirements are 240V single phase with minimum 40A service. To run all the equipment in the lab at once (including AC and overhead lights) is about 20kW; to run only the 120V equipment is about 8kW. 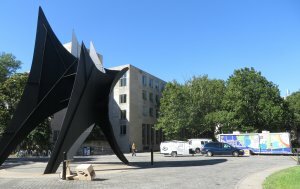 The MIT MFL has made the 3,000 mile trip across the U.S. several times, and is often stationed at a location for months at a time. The trailer is pulled by a Ford F350 with a professional driver who travels to the MFL. Experience with the original MIT MFL revealed that there could be some improvements to the design. The space inside the lab is limited. 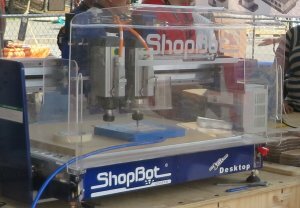 If the weather is not good (rainy, cold, too hot), then it can be difficult to use the ShopBot. 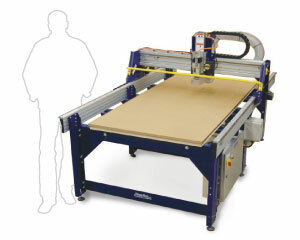 The full-sized gantry ShopBot was not designed to travel long distances over bumpy roads. The power supply to the trailer can be problematic when all the equipment is running. 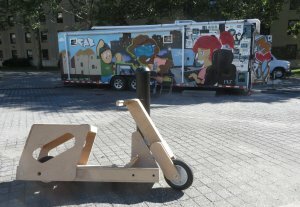 The MC2STEM Mobile FabLab (2011) was designed so that the equipment could be used in place, or rolled out of the trailer to be used in schools or for shows. All equipment is on carts, or chosen for its ability to roll and be plugged into existing outlets without requiring the services of an electrician. 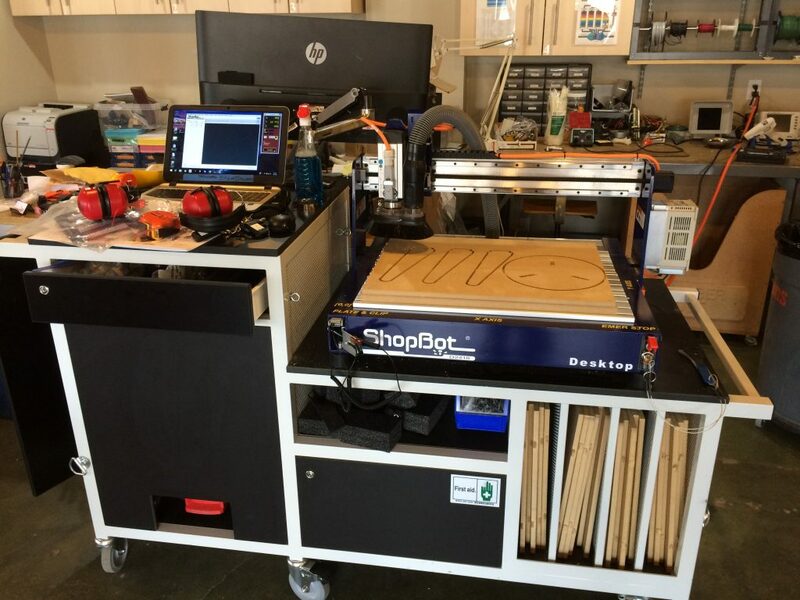 The ShopBot is a 48″ wide Buddy with a Porter Cable router. 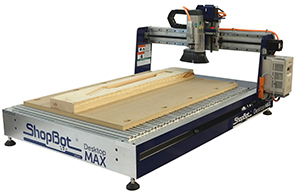 At the time, the Porter Cable router was the only option to allow the ShopBot to be plugged into a standard 15A 110 outlet in the U.S. An optional 4″ power stick means that a 4′ x 4′ sheet of plywood can be machined on the Buddy. The Buddy travels well when locked into place, can be used inside the trailer, and rolls out when necessary. 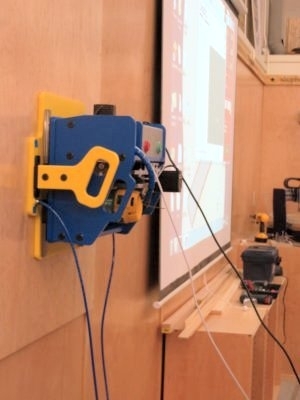 The Porter Cable router (not available for international sales) is loud when used for cutting through material rather than V Carving for demonstrations. Buddy from MC2STEM MFL rolled into position two floors up from the MFL. Shown is the standard setup, with 2′ of travel in the X (along the rails) and 4′ of travel in the Y (across the gantry). The 4′ power stick (plus out feed rollers) allows for a 4′ x 4′ sheet of material to be machined when desired. 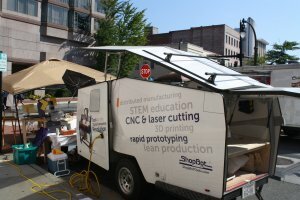 MC2STEM High School Mobile FabLab parked next to van pulling ShopBot Cricket mobile (MIT campus, Feb. ’11). A large pickup truck is required to pull the MFL. 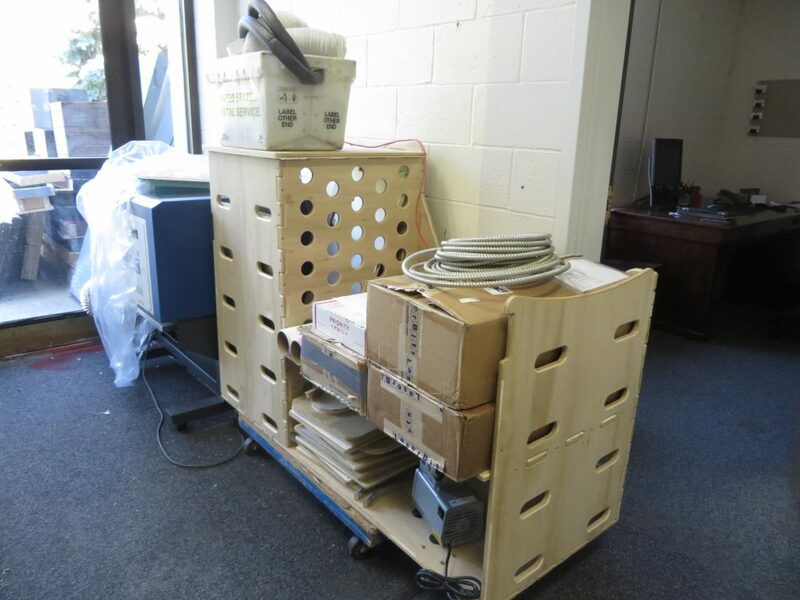 Laser cutter and other equipment outside the MC2STEM MFL. 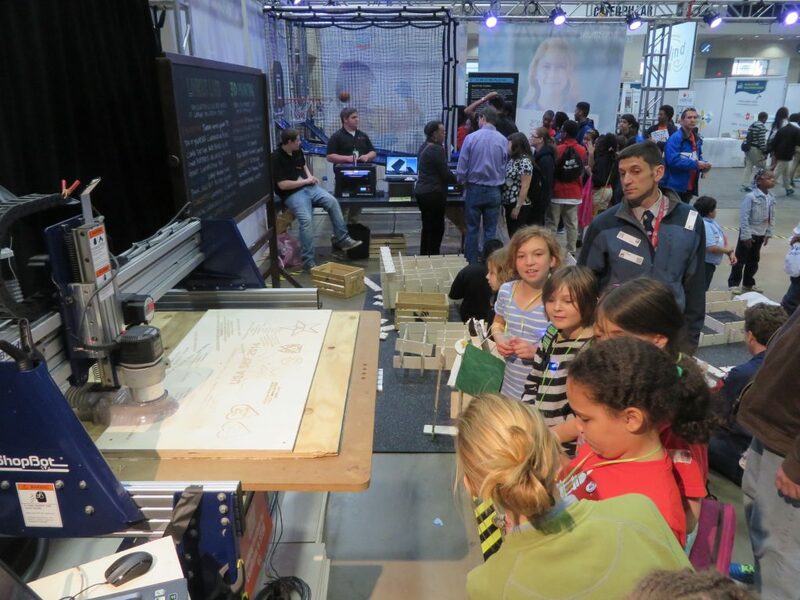 ShopBot Buddy was used in another display, so the Handibot stood in as the CNC router. 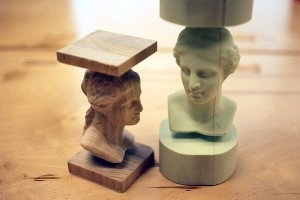 ShopBot Buddy in action, with Thinker Linker sets cut with the Buddy in the background. 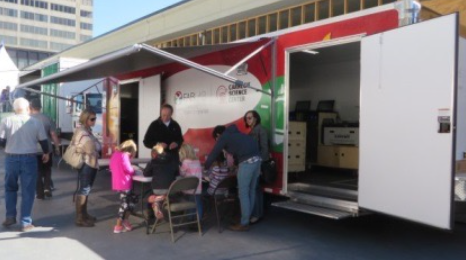 Like the MC2STEM MFL, the Chevron Mobile FabLabs (2015) are intended to be used with the equipment inside the trailer, or rolled out when needed for a school or display. All the smaller equipment is on carts that were machined on a ShopBot (as is the cabinetry in all of the MFLs). 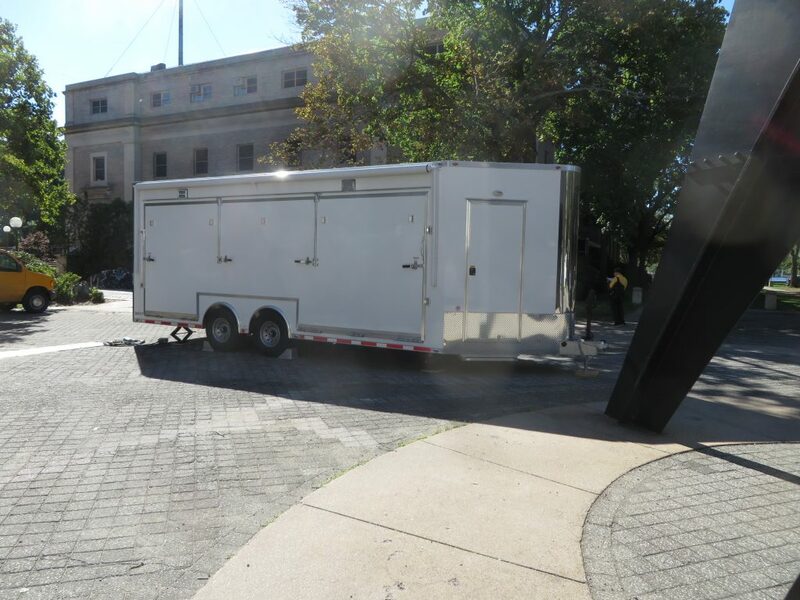 Carnegie Science Center Mobile FabLab onsite. Notice two doors to facilitate traffic flow through the MFL. A generator can power the MFLs, including the ShopBot, when they are on location. The ShopBot Buddy is set up with a 1HP spindle that can be plugged into a standard 110 outlet (the same spindle is available for 220V international power). 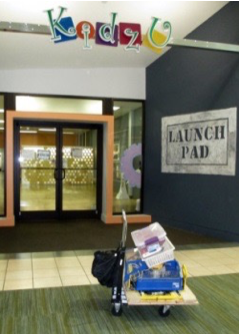 A prototype of the carts in the Chevron MFL (designed by Nick DiGiorgio, fabricated at Lorain County Community College, Ohio). Looking towards the front of the lab. Looking towards the rear of the lab. The ShopBot Buddy is locked into traveling mode. Each of these MFLs has a dedicated large pickup for towing. A note about power: it is best to avoid plugging the ShopBot with 1HP spindle into an outlet that has a GFI (Ground Fault Interrupt). 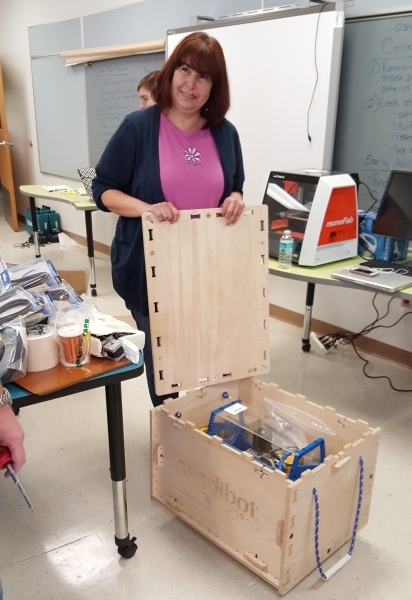 The Tulsa FabLab (2015) sets all of their equipment on sturdily built metal carts that also include storage for the materials used by the machine. 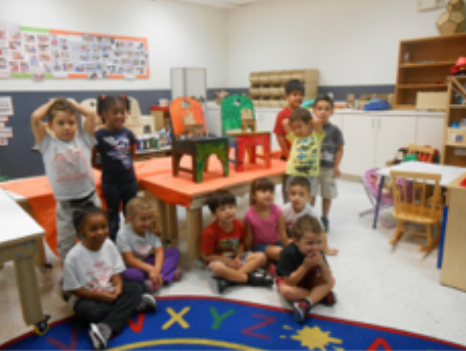 The carts can be rolled into a school or demo site. 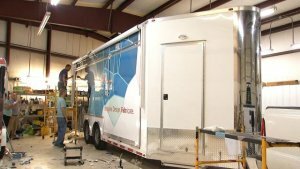 Tulsa Mobile FabLab getting its “skin”. It is important to consider the width of the doorways when building a cart or ordering a machine. While the Desktop has two options of enclosures, they can be wider than the standard U.S. doorway. The ShopBot Desktop with 1HP spindle weighs about 115 lbs. It is an excellent solution for many applications because its 24″ x 18″ cutting area allows one to machine projects in wood, aluminum and plastics. It also has the specs to machine circuit boards. The 1HP spindle is quiet, and can be plugged into a standard 110 outlet (220 version of spindle available). Another Desktop option is the Max, with a cutting area of 24″ x 36″ (approximately 610mm x 914mm). 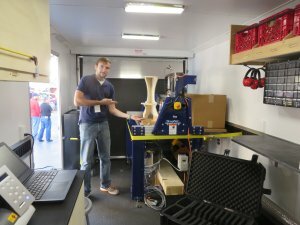 When Cricket Trailers purchased a ShopBot to fabricate their tag-along caping units, ShopBot decided it needed one to create a mobile display unit. 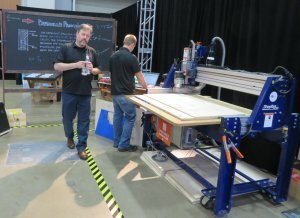 Originally (2012), the inside was modified from a camping unit to a two-layer bed that could hold two ShopBot Desktops. One Desktop faced inside so it could be accessed by people inside the Cricket when the roof was popped open. The second could be pulled out on to a rolling table set to the height of the back platform. A tent provides protection from the weather. Experience showed that the inside was too small for more than one or two people. The platform was modified in 2015 to one layer, and a single Desktop rides just above the wheels for transit. The rolling table still works well. When more than one CNC machine is necessary a Handibot is added to the Cricket. As mentioned above, it is best not to plug into a circuit with a GFI (ground fault interrupt) switch when using the Desktop with a spindle. 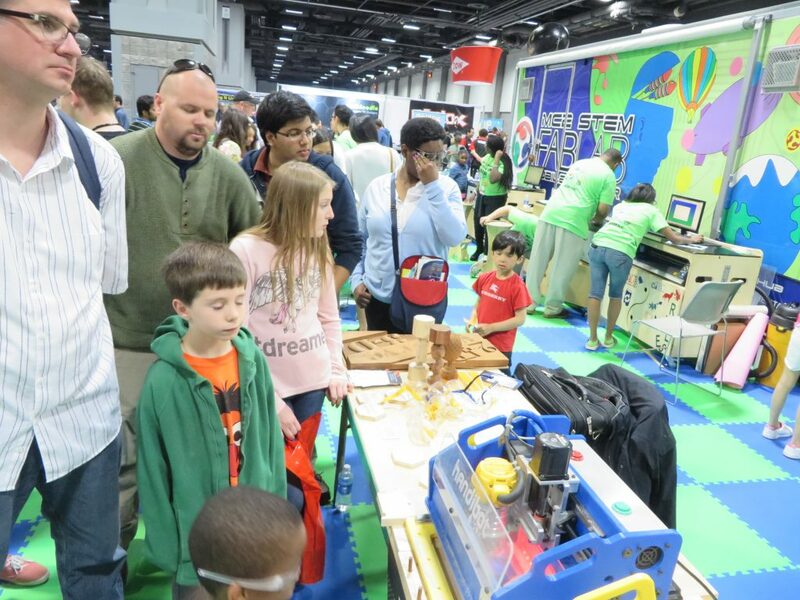 Desktop set up with double Z to mill and drill through circuit boards (Maker Faire New York, 2014). 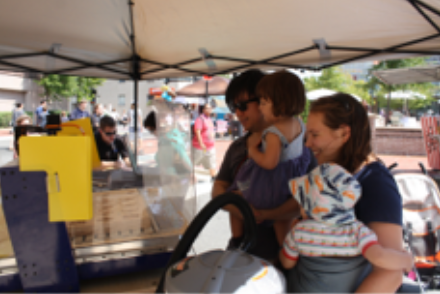 ShopBot Cricket with roof popped up at a street festival. The Desktop is pulled out of the back of the trailer on to a rolling table that is the height of the back platform. Desktop on rolling table set up under a tent. Cricket being pulled by a 2003 Chrysler van (MIT Fab11). 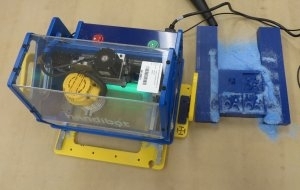 The Handibot is a job-site tool, and can be transported easily on a cart or in its travel box to a job or a classroom. 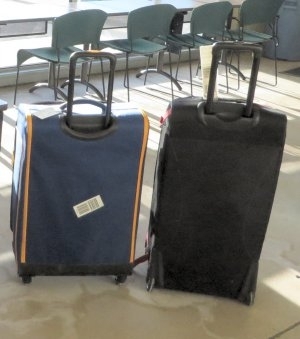 When packed in its shipping box or in the right suitcase, it weighs in under 50 lbs., which means it can be flown as regular baggage on just about any airline. While small in size, the Handibot is large in capabilities. Precise enough to mill circuit boards, it easily machines wood, non-ferrous metals (such as aluminum), plastics, and machinable wax. 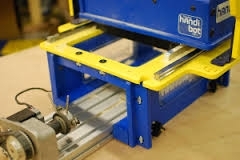 One can also index the Handibot to machine areas larger than its 6″ x 8″ (150mm x 200mm) work area.